Last year I purchased a Paul Jr. Magnetic Motorcycle Tank Bag for $35 at Walmart. I didn’t even know they carried motorcycle gear! I was just wandering around the automotive aisle looking for some oil when I came across a shelf of these bags. I have to admit I was skeptical about these magnetic tank bags. Surely, speeding down the highway, the wind would slip under the lip of the bag and rip it right off the bike. But it doesn’t! I couldn’t believe it. I’ve taken this bag out on a number of rides on bumpy roads, gusting winds, and speeds around 65 mph. I don’t have any fairing or windscreens on the Nighthawk, and the bag has never come loose one bit. The bag itself is a smaller size than many bags I have seen. However, I find it to be adequately roomy. I was able to fit a 16 oz. bottle of water, a rolled up long sleeve t-shirt, a bike lock, tissues, small bottle of hand sanitizer, sandwich baggie of trail mix, and I still had some room left. Inside the top flap is a thin velcro pouch, two pen holders, and a keyring clip. The clear map pocket on the outside is very convenient. It’s a bit of a struggle to get a map in there positioned how you want it. It’s also a rounded shape, so you have to do some creative folding for the most visibility. The map flap does detach, so you can take that with you if you’re off the bike and need to navigate on foot. There is a rain pouch included in the secondary zipper compartment. With the rain pouch rolled up, that’s about all that fits in there. (I can’t attest to how waterproof it is.) There is also a rubberized media port on the side of the bag, so you could snake a small cord through there (charging, ear buds, etc). The bottom of the bag (where the magnets are) is lined with a very soft microfiber, so it doesn’t scratch your paint. I make sure to wipe any dust off my tank before I put it on, just to be sure. The carrying handle seems very durable, and since the bag is magnetic, you can just pop it right off and carry the whole bag with you. This bag is actually the perfect size for the narrower gas tank on my Nighthawk 250. I positioned it with the handle pointing at me, almost touching the seat. That’s the ideal spot where it doesn’t interfere with handlebars or my riding position. It’s also below the gas cap, so I don’t have to take it off to re-fuel. 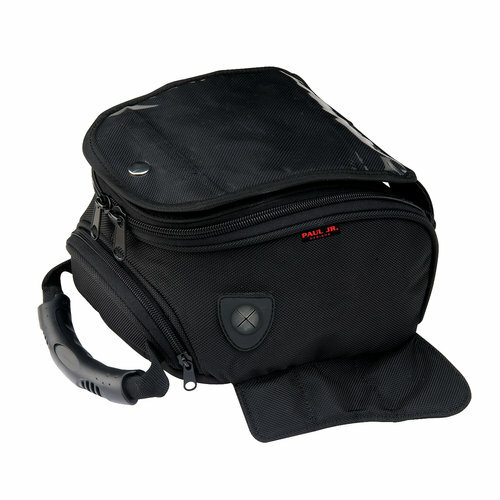 If you’re looking for a small, magnetic tank bag, this is a great value. It has some nice features, and seems durable. The bag is manufactured by Coleman. Feature-wise this bag is very similar to Cortech Super Mini Tank Bag, but the Paul Jr. bag is half the price. Update: I’m in my second season with this tank bag now, and I still love it. Unfortunately, Walmart doesn’t sell this bag online anymore. I’m not sure if you can still buy it in stores or not. Such a shame. It’s a very nice bag!